﻿﻿ The Division 2 Has A Big Surprise Ready For The Endgame on Readyforgame.com - Free Online Games! Since its debut at E3 2018, the developers behind the The Division 2 have focused on the sequel's endgame. It's a recurring topic for many online looter-shooters such as Destiny and Anthem, as it's often seen as the make-or-break point for a game's long term success. That's something the developers of the original Division know all too well. Players who finished its vanilla campaign inevitably hit a slump, leading to a repetitive cycle. Ubisoft eventually overhauled much of the game's mechanics and added in new encounters--leading to an impressive post-launch life for The Division. However, many players still burned out by the original release missed out on the revival once other games came around. With the sequel, Ubisoft is taking steps to ensure that it won't fall into the same traps as the original, while also giving the campaign a greater sense of purpose. We recently spent some time getting an early look at the game's upcoming private beta--playable February 7-10--which offers a tease for what's to come in the early hours of the campaign and the late-game content that follows. After you've established yourself in The Division 2's turbulent setting of post-outbreak Washington D.C. during the campaign, things take a more chaotic turn after the conclusion, forcing you to defend what you've built up in the expanded endgame. During this event, the developers spent some time reflecting on what they learned from the original game and detailed their approach in the sequel. "One of the biggest things for The Division 2 is the importance of the endgame and our focus on it," said creative director Julian Gerighty. "We launched The Division 1 with very little in terms of endgame content. It was a great campaign, you reached level 30, the endgame started, but it was lacking in activities. We were trying to operate this live game, yet we saw things that weren't working out for the long term. That's why a very tough decision was made before patch 1.4, which was to stop the development on all of the planned features and the DLCs to be able to focus on the technological debt and on the improvements to get the game to where we wanted it to be. That all fed into how we've set up The Division 2 production-wise, creatively as well." The Division 1 is a vastly different game now than it was at launch, and all for the better. That second wind is something that the developers wanted to carry over into the sequel, which they did in a few important ways. 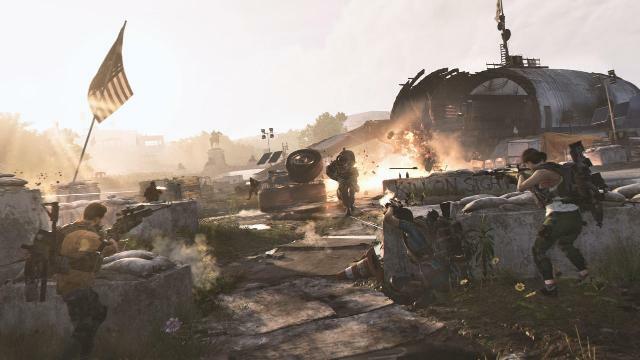 For starters, The Division 2 will incorporate much of the existing game's content from the post-launch updates, which includes update 1.2's bounties, 1.4's world tiers, 1.6's exotic weapons, and 1.8's PvP arena. These features will also be available for all players at launch, and future DLCs for the first year will be free. This is not only to stay consistent with the current game's flow and meta but also to ensure that the community would stay engaged. With the new game, there also comes a fresh start for all players. Whereas the original was set in Manhattan, Division 2 brings a new set of agents to the nation's capital, which introduces new systems and world events that occur in the field--presenting more moments and opportunities to leave a large footprint. At the beginning of the demo, our first mission was to retake the White House from one of the opposing factions, which becomes your base of operations soon after. Over the course of the campaign, the White House increases in influence and followers the more you expand the Agency's reach throughout Washington D.C. In order to reassert control over the city, you'll set up new settlements and interact with key characters who will aid in your rise to power. Some NPCs are recruitable and can even be brought to the White House to upgrade the various areas--leading to new items and perks to acquire. Exploring ruined D.C. offered plenty of opportunities to meet new characters and come across control points that are in constant dispute. Though D.C. doesn't have nearly as strong of an atmosphere and eerie vibe as the original, it does fill that void by presenting more reasons to explore and engage in the various side-missions. Much like in the original, there are ECHOs that allow you to play back moments from the lives of supporting characters. While the original's take felt one-sided since the characters were dead long before you arrived, several of the persons of interest in The Division 2 are alive and reasonably well, and the ECHOs offer more details about their connections to others throughout D.C. Things, however, take a particularly surprising turn in the endgame. A new threat in the form of Black Tusk emerges, leading into the broader endgame that shakes things up. Similar to the Hunters from The Division's 1.8 update, who only appeared in the Survival mode and Underground DLC, Black Tusk is a roaming faction that serves as the antithesis of the Division agency. Possessing an arsenal of high-tech weapons and gadgets that match your own, this new faction invades D.C. and actively tries to retake areas of the city--and even the Dark Zones. In the two endgame missions we played, one in the Air and Space Museum and along with the Federal Emergency Bunker, the Black Tusk proved to be a powerful force to be reckoned with. Along with using robots that look like they come right out of the Boston Dynamics lab--except they actually have guns this time--the endgame faction also uses mini-drones, and have soldiers wearing heavy armor that require strategic shots to open up weak points. During the endgame, you'll unlock new specializations that further enhance your character, which also open up power weapons like the grenade launcher, heavy sniper rifle, and the crossbow. In order to find better loot and gear, you'll have to tackle missions that are several notches more challenging than the campaign. But as is typically the case for endgame content, you'll also be repeating some older missions. The Division 2 does, however, spice things up by introducing a new tier called Invaded missions. During the endgame, all previous missions from the campaign will have a new difficulty that replaces the existing enemies with the Black Tusk. To cut down on repetition, the Invaded missions will also randomize each encounter with Black Tusk in the level, leading to different fights with enemy squads on each playthrough. This new faction also changes the dynamic of the Dark Zones in the endgame, which actively occupies one of the areas. As we detailed in another preview, the Dark Zone's PvPvE (player-versus-player-versus-environment) dynamic has been upgraded for the sequel. In addition to three separate zones, all of which have story missions that allow you to get your feet wet, the endgame will introduce an Occupied Dark Zone. With one Dark Zone under occupation by the Black Tusk faction, which cycles to a different location every week, the occupied zones also remove certain handicaps from the base version of the PvPvE mode, particularly level-balancing and friendly fire. The skirmishes with Black Tusk during the two missions we played were intense and required some solid communication from our team to make it through. However, the invaded missions also felt a bit exhausting as well, leading to some moments where we were trapped in a room for up to 10 minutes dropping squads of bullet-spongy enemies as they funneled in. Though this is often the case for endgame content, it definitely hurt the pacing of some otherwise thrilling missions. Granted, we were just dropped into these missions for the purpose of this demo, which came after the rather brisk early game missions we played at the beginning. They may flow better once you've invested the hours to work your way to this content. However, this also reminded me of some of the larger issues I've felt from The Division 2, in that it comes off a bit too similar to the original. It strongly emulates much of what worked in its predecessor, almost to a fault. Though some of the new innovations make for a more engaging and interesting setting to explore, the general looter-shooter loop itself can be exhausting, and lead to those familiar moments of occasional tedium that bogged down the first game. Having said that, I do feel the new approach to the endgame, though somewhat overwhelming, does offer a more compelling hook that felt absent from the original. By tasking you to defend the place you've been actively building up and investing yourself in throughout the campaign--which can be taken by the enemy faction. It creates a greater sense of urgency in the late-game, which was lacking from the original. Ubisoft seems to be on the right path for The Division 2. Though it's obviously building off of what came before, the new features do seem to be a natural step up that plays to the renewed strength the series saw with its revamped gameplay from the original. Ubisoft's approach with this private beta was a neat way to kick the tires from both ends, and it'll be interesting to see how players--even those that missed out on the revival of the original game--will take to it. The Division 2 is series' second chance, and hopefully it'll be able to make good on it's renewed vigor. For more info on The Division 2, including how the new Dark Zones work and how to get into the private beta, you can check out our features and articles on here on GameSpot.